Heavy-duty 4 mixing bowls nestle into one another even with the lids on for multipurpose and space-saving easy storage under the cabinet or on countertops. From medium to extra large sizes: 7-1/2", 9", 10", 11-1/2". Thick & durable construction, chip & stain resistance. Non-slip gasket on the bottom of each bowl provides improved grip and surface protection. Stylish wave pattern design makes beautiful house warming gift, outstanding potluck showcase, and fresh look to both contemporary and traditional kitchen. Bowles (but NOT the lids) are top rack dishwasher safe. Not using in the microwave or oven. High-end quality. Beyond the Amazon's A-Z protection policy, you are backed by Surpahs 100% satisfaction guaranteed program, welcome to compare. 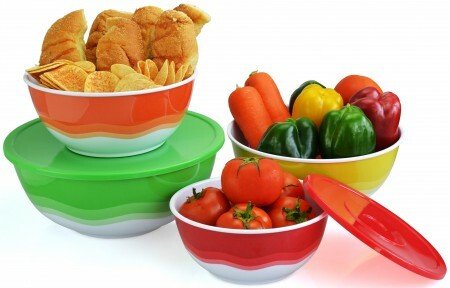 Beautify melamine plastics mixing bowls come in trendy colors: green, orange, red and yellow with color matched lids, makes a great unique wedding gift, bridal shower presents, or outstanding housewarming happies. The best set of bowls to accomplish task perfectly to everything from being used with stand mixer to create volcano lava, make a big macaroni salad, prep food and also as serving bowls. Package Included: 4 Bowls; 4 Lids. NOTE: Not for use in the microwave or oven. This is 250 times lower than the level of melamine (alone or even in combination with related compounds - analogues - known to increase its toxicity) that FDA has concluded is acceptable in foods other than infant formula (2,500 parts per billion); in other words, well below the risk level. In addition, such highly acidic foods make up only about 10% of the total diet, so the dietary level of melamine in these scenarios would be less than one part per billion. However, when highly acidic foods are heated to extreme temperatures (e.g.,160 ° F or higher) . the amount of melamine that migrates out of the plastic can increase. Foods and drinks should not be heated on melamine-based dinnerware in microwave ovens.